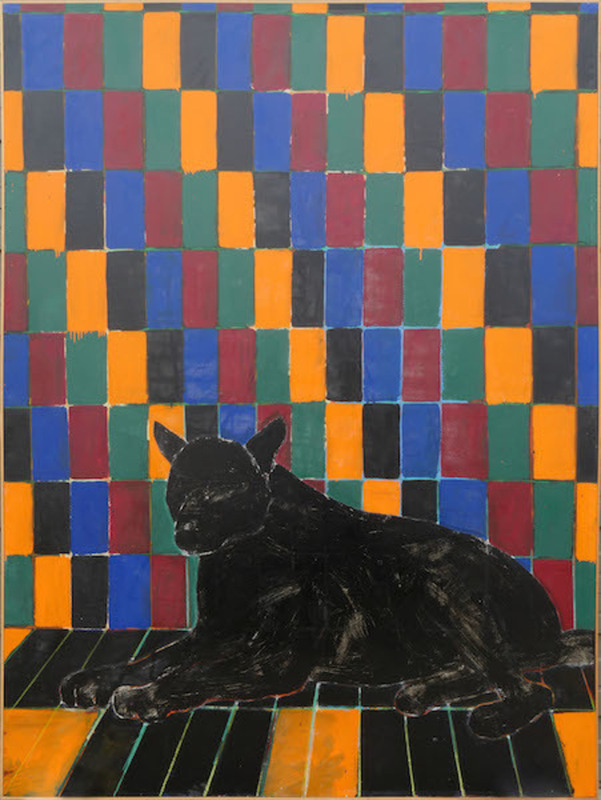 Joan Brown, Wolf in Room, 1974, enamel on canvas, 97 x 72". Why isn’t Joan Brown taken seriously? Despite support from curators and collectors throughout her trailblazing, four-decade-long career, Brown remains shockingly left out of the conversation. There are a few factors to consider: Brown was closely affiliated with “West Coast art” in the 1970s and 1980s, when the term was still used pejoratively; her sentimental subject matter was way ahead of its time (consider her domestic scenes, kissing couples, animal portraits, as well as various family members); and most notably, Brown wasn’t afraid of painting an ugly picture, as her inclusion in Marcia Tucker’s landmark “Bad Painting” exhibition of 1978 attests. This concise and satisfying sampling of Brown’s oeuvre offers the opportunity to bask in the glory of the prolific and ambitious artist, one pleasingly lurid canvas at a time. In her early twenties, Brown experienced a flash of success and fame as part of the Bay Area Figurative Movement—in a 1963 article, Artforum patronizingly referred to her as “everybody’s darling.” But Brown’s work shifted away from expressionism and moved into territory uncomfortably close to the graphic arts in the mid to late 1960s, as exemplified by Wolf in Room and The Swimmers #2 (The Crawl), both 1974. Brown turned to comic figuration at nearly the same time as Philip Guston, whose new work was equally reviled. Brown painted contemporary life in a bizarrely ordinary manner and with great deliberation. Even her most seemingly simple work brims with caustic wit and humor, tempered by an uncommon sense of humility. New Year’s Eve #2, 1973, shows a woman and a nattily dressed skeleton tangoing under a city skyline, assuredly ushering in the New Year. Keenly aware of the absurdity of being alive, Brown painted our chaotic world exactly as she saw fit.